Preserve Them, Don’t Lose Them! Marion Clifton Davis was born in a poor family. He worked hard his entire life, and his efforts were rewarded: Davis became a successful entrepreneur in the sphere of real estate by earning several millions worth of fortune on land plot transactions. However an incident that happened in 1994 changed Davis’s life drastically. On one rainy day he got into a traffic jam and accidentally saw a school poster about a presentation on black bears. He knew next to nothing about these animals but he got interested in this advertisement and attended the event. From that day on he began reading books on ecology and study the environmental problems of Florida, his home state. After a few years, in 2000, Davis started buying lands that subsequently became the Nokuse private preserve with a total area of 53,000 acres (220 km2). In 2014 Davis was diagnosed with 4th stage lung cancer, and in July of 2015 he passed away at the age of 70. He left almost all of his fortune for the development of this project, as well as for the support of the educational center that he had created and that is visited by thousands of Florida school students every year. We had a talk about this unique private preserve and the restoration of Florida’s ecosystem with the director of Nokuse, biologist Dr. Matthew Aresco who joined the project (on Davis’s invitation) practically at its very start. – Matthew, could you tell us what environmental problems existed in Florida at the moment when Mr. Davis decided to start the state’s ecosystem restoration? And what was Florida’s environment like before human interference? The Nokuse preserve is located in Florida, on the northern coast of the Gulf of Mexico, in the southeastern United States. Historically the local ecosystem was dominated by longleaf pine (Pinus palustris). The areas occupied by this tree were stretched from North Carolina to the east of Texas, including Georgia, southern Alabama, southern Mississippi and Florida. But gradually under the influence of many different factors, mostly deforestation, the longleaf pines ecosystem was destroyed. By the early 1940s almost all of these pines were clear cut. The cleared lands were used to grow agricultural crops. 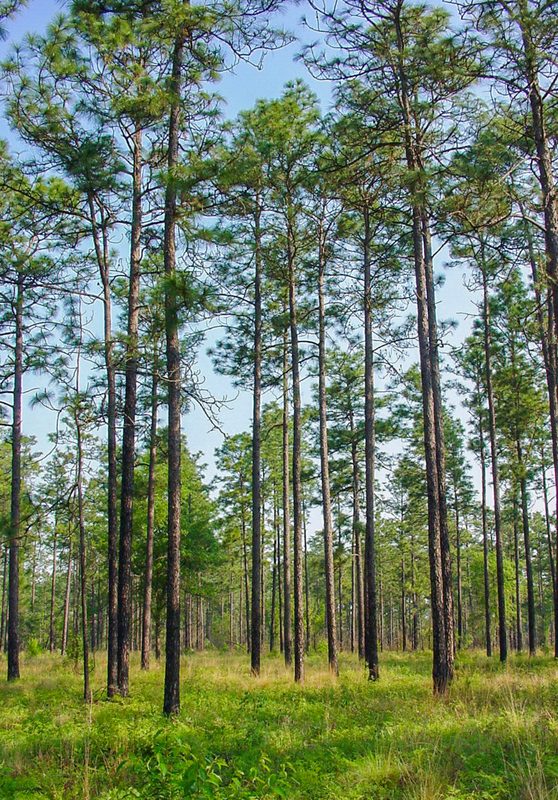 Later they started printing paper and longleaf pines were replaced by other trees, more suitable for these purposes: the slash pine, the loblolly pine, the sand pine. Besides, the development of hunting in the past 30-40 years has also reduced the root ecosystem areas. Together with the longleaf pine ecosystem we also lost wildlife habitats of many species of animals and plants, which are now rare or endangered. Mr. Davis bought lands with destroyed or damaged ecosystem and united them into a natural preserve in order to safeguard them and bring back the original historically developed ecosystem. And up to this day these are our goals: preservation of natural areas, protecting animals and plants and restoration of the ecosystem. − When did you join this project? I came to Nokuse in January of 2006. Shortly before that I presented my Ph.D thesis at Florida State University on freshwater turtles inhabiting the northern lakes of Florida. I had researched this subject since 2002 while working on the project aimed at preserving tortoises that died by getting run over by cars when they were trying to cross the road near Lake Jackson, north of Tallahassee. This project found some support, and as a result, underground passages were built that allowed the animals to cross the road safely. And thanks to this project I met Mr. Davis. − What have you achieved since the time the preserve was founded? 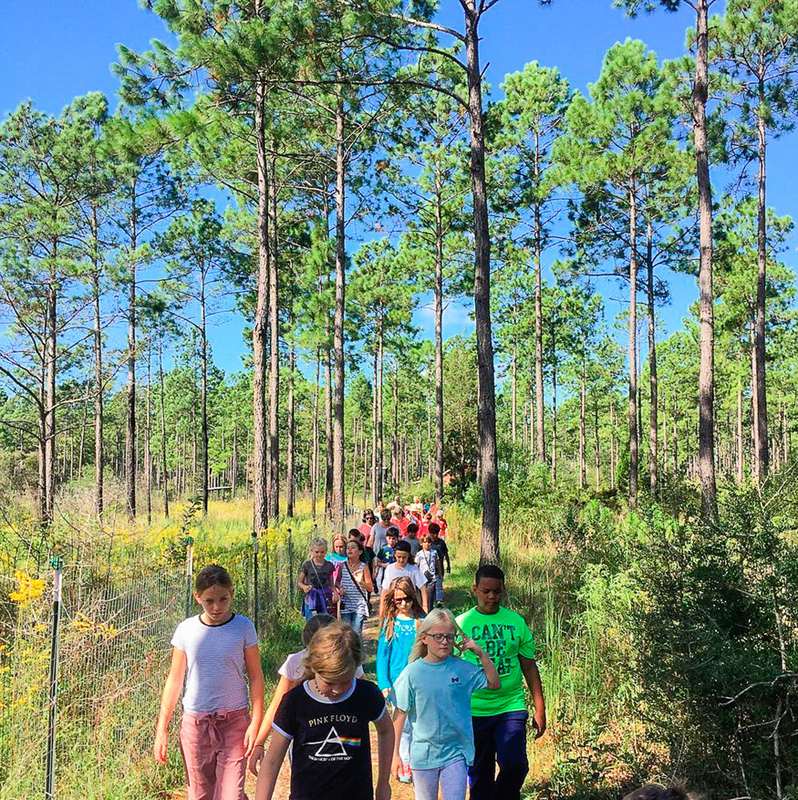 In order to achieve the planned goals, we started a program for restoring the ecosystem of longleaf pines and returning the animals that used to inhabit it. And this program has been functioning for about 10 years. 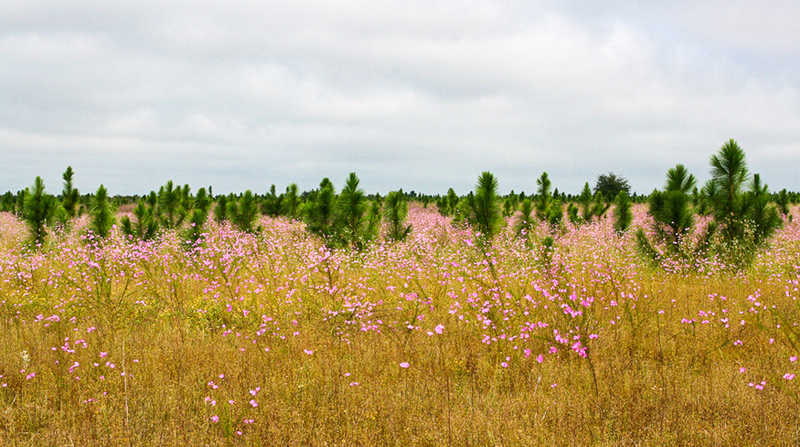 We have already planted almost 10 million trees on the lands where longleaf pines had been completely removed. We are also restoring the plants that used to grow in the understory. We were able to find the needed seeds for that. The understory has thousands of species of plants, and such a big variety is extremely important for the ecosystem. The main plant of the lower level is the wiregrass, but the previous use of these lands for agricultural purposes has completely destroyed it. We took seeds from the few areas where wiregrass had been preserved and created special nurseries to sprout the seeds. Then we collected seeds from grown plants and planted them out in the places where grass had been destroyed. We also have a lot of carnivorous plants such as the yellow pitcherplant: these are hydrophilous plants that grow in moist soils. 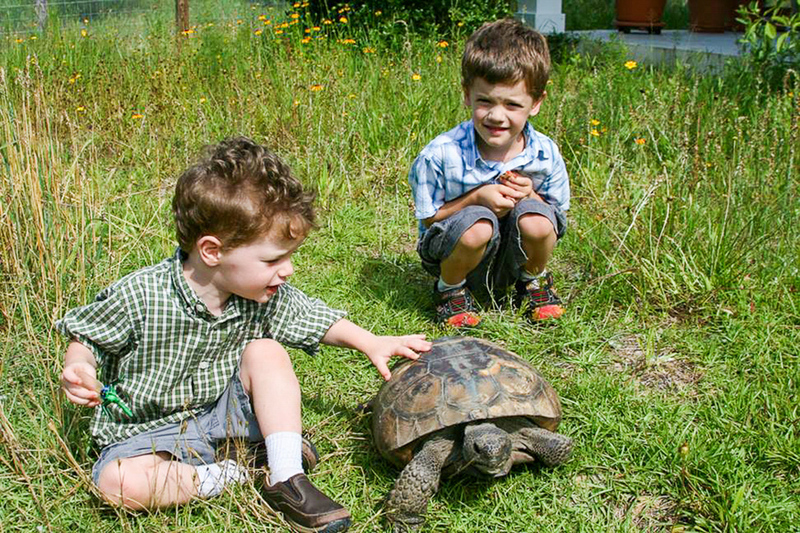 As for animals, one of the most important species of this ecosystem are gopher tortoises. To restore their population we relocated over 5000 of these tortoises from development sites in Florida. They are long-living animals, they can live for over 100 years. 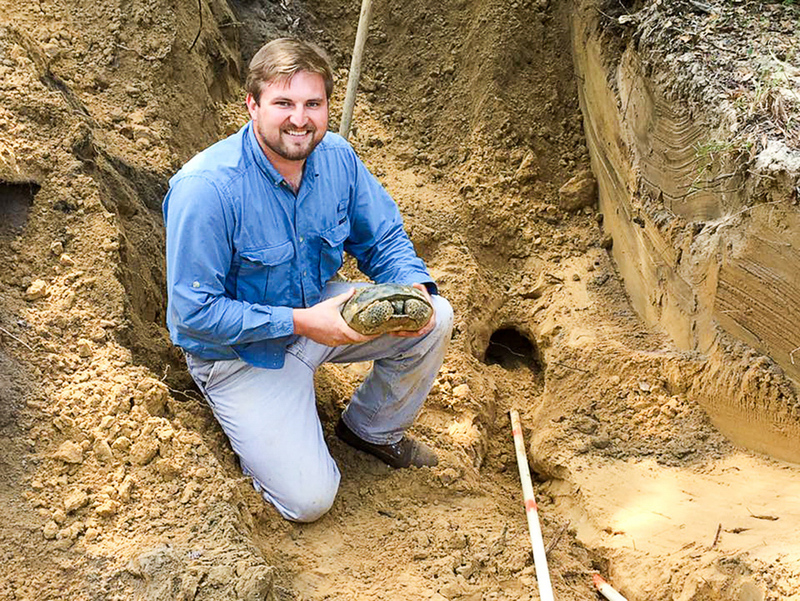 In sandy soils gopher tortoises dig holes that may be up to 20-30 feet (several meters) deep. These holes help the tortoises hide from both summer heat and winter frosts. But these same holes are also important for other animals that inhabit the longleaf pine ecosystem. Over 360 species use tortoise holes as shelter and habitat. The holes are utilized by unique species such as gopher frogs or eastern indigo snakes, as well as many other species of snakes, amphibians, land birds and mammals. 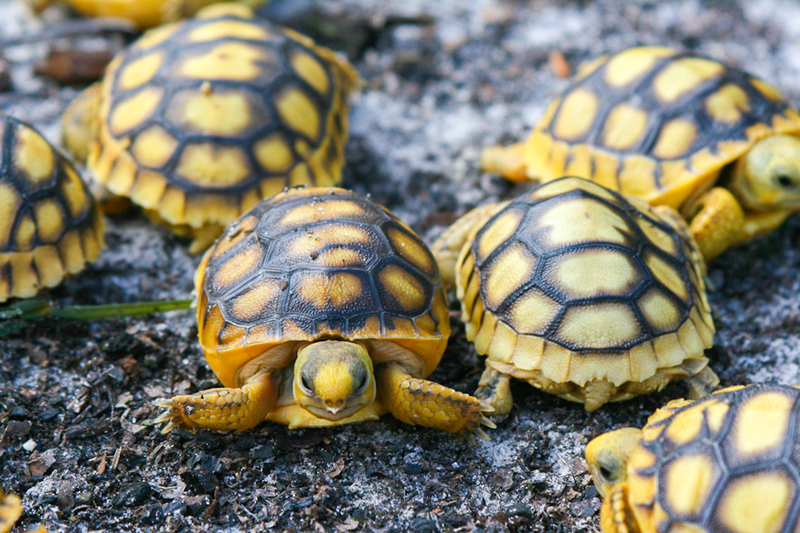 The absence of gopher tortoises had a bad impact on the population of many other animals, so the return of these tortoises to these areas was a very important step in the restoration of the ecosystem. We call these tortoises our «keystone species», that is how important they are for the ecosystem. By also feeding on plants, they disperse their seeds. 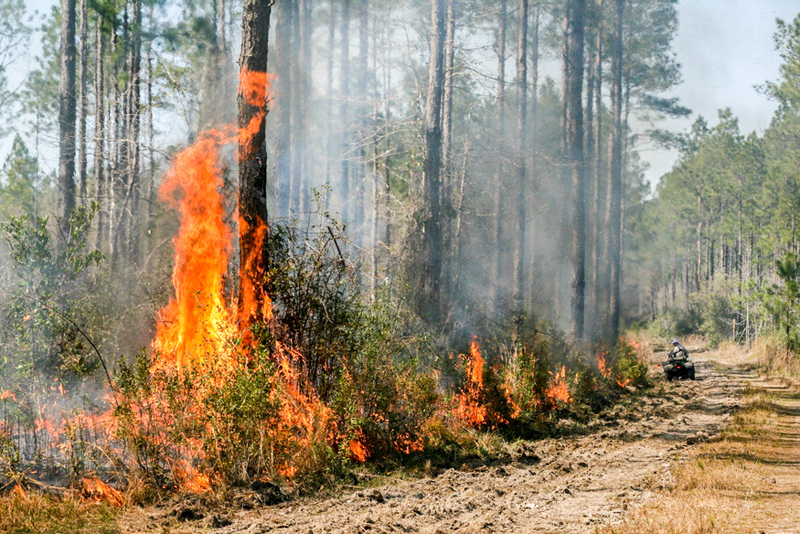 And there is one more very important thing: an essential element of the longleaf pines ecosystem is fire, which is why in our preserve we actively use the prescribed fire technology. − Well, this is quite unexpected: so to make your forest grow, you burn it? You see, historically our region is one of the top areas, not only in the USA and North America, but in the whole world, in terms of frequency of lightning strikes. Between May and August each year there are many thunderstorms and lightning strikes that often lead to natural wildfires. These are the conditions that gave rise to the biological system of this area, so most of the local animals and plants have adapted to fires and their consequences, and fire plays a very important role in their lives, being the important part of the ecosystem. The longleaf pine very often gives in to other coniferous trees so it would soon disappear in any place with other types of pines growing in it. It is fires that allow the longleaf pine to get rid of unwanted competition. At the same time even the strongest fires do not hurt or damage longleaf pines themselves, because their roots and trunks are well-protected from high-temperature exposure. Even the seeds of this tree are fireproof. Besides, without the fires the understory can grow too thick. In that case the bushes will be too high, and they will throw a shadow that will get in the way of grass’s growing. And that in turn may lead to the mortality of the understory plants because sunlight is vitally important for them. Back in the day the fires caused by lightning strikes would burn thousands of acres of these woods. A lot of animals and plants would rely on fires that kept this ecosystem open. But now this situation has changed. The truth is that spontaneous fires, in spite of their benefits for the forest, are also dangerous for humans. So now fire-fighting squads try to eliminate these fires immediately. So the natural fires caused by lightning strikes have been replaced by controlled ones. A controlled fire is a tool for working with lands that is quite widespread in the southeast of the USA. It is a planned and purposeful burning. We determine the area you need to burn down and then on a specific day we release a team that does the burning. And this burning usually continues for the entire day until the whole planned area is burned. By nighttime the work is finished but the next day it starts again at some other place. Here in Nokuse we burn down about 10 thousand acres (4,000 ha) every year. We have a team that understand the importance of burning and perform this job very well. As a result, we get an excellent wild habitat. − The history of your preserve goes back to a poster about a school presentation on black bears. Are you expecting this large predatory animal to inhabit these areas some time in the future as well? The black bear had a very special importance for Mr. Davis. In order to bring these bears back we need vast lands: that is a natural requirement for this species. And of course it was taken into consideration when planning the total area of the preserve, as well as regarding the adjacent community lands to the east and to the west. By the way, the name of our preserve, Nokuse, originates from a native Creek word for the black bear. We launched the black bears preservation program in 2002. At that time there were very few of them here. But now we can see more and more of them. Sometimes we see female bears with cubs and that is how we know that they are reproducing. In other words, we note stable growth of the number of black bears, so I’m sure that one day we will have a large healthy population of them here. Today the main problem and danger for these bears are roads. Bears, just like other animals, often cross them, but it is bears that get killed a lot on the roads in Florida. It is very important to build special passages in the places where bears cross the road especially often. We worked on such a project a couple of years ago. We approached the Florida Department of Transportation about this, and they built 3 large underground passes under the highway. It is one of the most effective ways of preserving the bear population: help them to avoid being run over. − How do you make the preserve a natural habitat for a very large number of different animals, as opposed to just one or two species? Our preserve includes many various habitats. The preserve’s area is very large and consists of many ecosystems. For instance, we have some boggy areas, we have the Choctawhatchee River. This mosaic-like variety of habitats is exactly what is needed to save and preserve as many species of animals and plants as possible. Some of these environments are unique, and they have been created deliberately. Another thing is that the preserve lands must be free of roads: it is very important to keep all the wild animals intact. During those years when the land was used for agriculture there were many roads, and now we close them one by one so that this area goes back to being wild. We are a private preserve, so we only open a small part of the area for public use. For that purpose we have a hiking route about 12 miles (19-20 km) long called Florida National Scenic Trail. And this route is restricted to a specific small part of the preserve. Tourists can walk along this route freely, but they are not allowed to come off it. There should be as few people in the preserve as possible, because the preserve is created for animals and it is important that the ecosystem is restored in a natural manner. − What would you say are your main achievements? Our preserve is an opportunity to save a very large patch of land in its natural state, despite it being located in one of the most rapidly developing areas in Florida. Mr. Davis had an opportunity of buying these lands and uniting them into a large preserve. But before that they had been several plots of land isolated from each other. Mr. Davis bought them one by one and combined them into a single whole, which was important from an environmental point of view but also for other reasons, too. And the very fact that he did that was already a huge step. 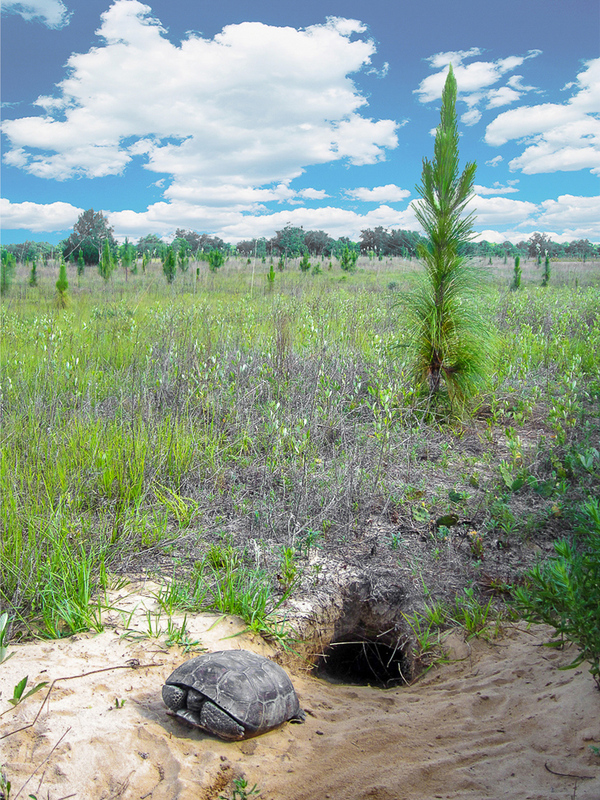 One of our biggest achievements (especially important for myself personally) is the large-scale relocation of gopher tortoises (Gopherus polyphemus) in Florida. In the land development areas we saved thousands of tortoises from getting killed. And now they live here, under our protection. It is important to understand that our project is still very young, because Mr. Davis conceived it and planned it as a 300 years long project. But he passed away, and we continue working to bring his vision to life. Being able to plant thousands of acres of longleaf pines within such a relatively short period is our way of expressing gratitude to mother nature. Now our lands are well-guarded, they are all covered by conservation easements to the State of Florida, which prohibits any construction or development on these areas, and that is exactly what we need; we don’t want these lands developed even if their owner changes in the future. − Why does the project comprise 300 years, not 100 or 500? What is the significance of this specific time-frame? 300 years is the approximate time period at the end of which we are going to have a mature longleaf pine forest. Longleaf pines can live for over 500 years. But even in 50 years we are going to have thousands of acres of mature enough trees. In 100 years we will come really close to the desired result. While at the age of 140-150 the pines will start showing the first signs of old age. Mr. Davis looked ahead in the long term and saw the outcome of his work somewhere in the future. He chose the 300 years mark as some kind of a clear goal, as the point when we know for sure that the system we have created is absolutely sustainable and self-sufficient. Needless to say, I won’t be around in 300 years, so it’s clear that we need to pass the responsibilities to the next generation, and they will pass them to the generation that comes after them, and so on. And we really hope that in the future this project is going to be continued in the same spirit as when we started it. We will have to rely on the future generations and hope that they will care about this as much as we do. Lands must stay protected, and the proper management of these processes is extremely important. Mr. Davis was a great man. He completely devoted himself to this work. He never spared his money and he did everything he could so that we would have the possibilities and the resources to continue his work. He was committed to the idea of restoring and preserving the ecosystem as no one else was. − What are your main objectives for the next 10-20 years? Our goal is to continue the work on restoring and managing these areas. There are still a lot of animal and plant species that have been destroyed, and that we would like to return to these lands, to recreate their habitats. For example, we want to bring back the red-cockaded woodpecker. This species of woodpeckers was declared endangered by the Federal Government. Red-cockaded woodpeckers inhabit woods with mature longleaf pines. After our trees grow up a bit, we will be able to use some of the mature pines as a starting point to bring these birds in. The gopher frog is another species that was destroyed, and we still need to work on it as well. These frogs still can be found at the military base a short distance away from our preserve, which means that we can get their eggs and put them into our ponds, thus restoring their population. Another species that we are trying to bring back is the reticulated flatwoods salamander. It’s an amphibian, and it has also been pronounced endangered at the federal level. And again, the only way of restoring its population is to get the eggs, nurture the larvae and then release them into our ponds. The preserve also has many species of snakes, some of which are quite large. For instance, the indigo snake may be up to 2 meters long, and we are planning on restoring its population too. Besides, we would like to expand the area of our preserve further, so we keep looking for opportunities to buy new lands. And, of course, we are going to continue the restoration of the forest and the understory. And that is not an easy task with an area as large as this. Every year we plant some amount of longleaf pines: sometimes more, sometimes less. This year we planted 700 acres of longleaf pines, some years we covered up to 1000 acres, some other years we only did 500. But reforesting the entire area with these pines will probably take about 20 years. 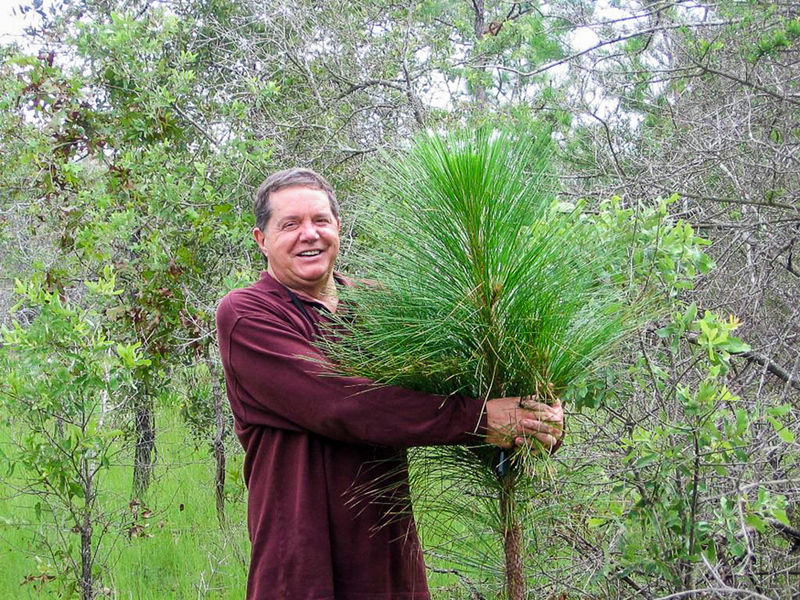 We started planting the longleaf pine in 2004, i.e. the trees that were planted at the beginning are now 13 years old. Eventually the entire preserve will be forested by these pines. And after they take root, we can start introducing other trees. Our objective is to create an ecosystem characteristic of the natural environment, because at some point we will stop interfering in the natural processes that will begin happening in these woods. Moreover, our conservation easements forbid anyone to cut down trees inside this preserve. − Tell us about the Nokuse team. Who are the people who do all this hard work? In fact, our team is quite small. There are five people beside me who work full-time, and a few people with part-time positions. It is not a lot of personnel for such a large area, but we try to work efficiently and productively. Actually I think that it may even be easier to work with such a small team than if we were 20 people or more. We don’t have any clear separation of duties and none of us specializes in only one thing. The only exception is one person whose only job is to take care of gopher tortoises. He examines them, records all the information about them in a special register, helps them to adapt to the preserve’s environment, releases them into it and also tracks them in order to make sure that they survive and reproduce. The rest of the team members do a little bit of everything, so we all can do a lot of things. There is always a lot of work, and emergency situations happen a lot too. Even I, as the director, do not only make decisions but also often do manual work. But as for planting trees, we usually hire a separate team for that every year, because planting is a highly specialized task. But having said that, we always supervise this task anyway. − Are you planning to share your experience, to distribute it to some other areas? Yes, we are indeed a good example for other companies that plan to do land conservation work. Reforestation is a big part of this process. Very often a private company like ours will achieve better results than if it were done by a municipality or the US government. The question of «Who owns the land?» is very important, and if the land is owned by the government it usually means a lot of limitations. This is why for a private owner it’s easier to restore the natural environment of some area. But of course, someone must create conditions for that first. We were very lucky to have that kind of a person. Mr. Davis not only possessed the necessary resources but also had a strong desire and commitment to start this project. There are of course other people who did similar projects in the USA. For instance, Ted Turner created a few preserves, too. He managed to save vast lands in the western part of the USA. There are many wealthy people in the world, and if they spent at least part of their wealth to protect the environment, we would be living on a different planet now, while fewer animals and plants would be endangered. We hope that we can serve as a model for people who want to do the same. At least by showing them that it is possible. There are a lot of areas that need to be preserved in their natural condition, even in our state alone, but we need financial resources for that, and currently there are not enough of them. − We know that Nokuse has a children’s environmental education center called E.O. Wilson Biophilia Center. What educational programs for children do you have, and how long do they normally last? What goal do these programs have: is it vocational guidance, broadening the children’s mindset or teaching them to treat the nature in a responsible way? How can this be achieved? After Mr. Davis created this preserve, he also founded an educational center in order to teach the younger generation to treat nature properly and to explain them how important it is to preserve it. Unfortunately today kids are very much out of touch with nature. They spend too much time with computers and gadgets, and they know very little about the environment. Famous biologist E.O. Wilson agreed that the Center would be named after him. The Center was opened in 2009, and since that time every day it is visited by 100 to 150 children from nearby schools. Each of them visits the Center several times a year to learn different subjects. We have classes for the 4th, the 7th and the 10th grade students. For example, if some kid visited our Center in the 4th grade, then next time he or she will come in the 7th grade, then in the 10th. The Center has an exhibition hall where we keep animals that cannot be released to the preserve for some reason, usually because they are injured or wounded. For instance, right now we have 2 bald eagles (and that is the national bird of the USA), some tortoises, snakes, 2 bobcats, owls, hawks and some other birds of prey. And we show them to school students so that they get a chance to see these animals, to interact with them. The main message that we are trying to convey to children is as follows: wild nature is a value in and of itself, while humans are only a part of nature, and the rest of the living things are just as important as us. Most of our classes are aimed at making children understand this. I also think that it’s very important that when children go out to the woods, they get to touch these animals, to hold them. This is how they get an emotional attachment to nature, or possibly even affection. My own love of nature, for example, began exactly when I first saw wild animals with my own eyes. When I was a kid I found a turtle, and I still remember taking care of it... So it is necessary that children have their own experience of interacting with nature. We are not trying to make them all become biologists. This is merely an awareness-raising project, so that the future generations know and respect the environment and understand the importance of its preservation. They will grow up, become businessmen, government officials or someone else but we hope that they will still remember these lessons and will treat our natural environment with care.